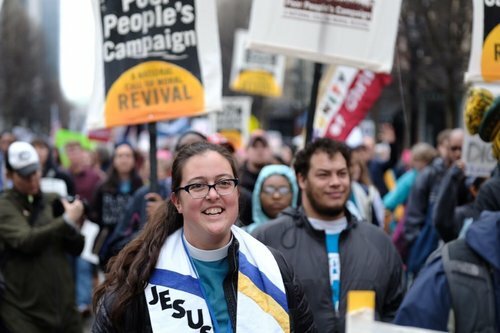 The Reverend Dr. Liz Theoharis is an ordained minister with the Presbyterian Church, the director of the Kairos Center for Rights, Religions, and Social Justice at Union Theological Seminary and the co-chair of the Poor People's Campaign: A National Call for Moral Revival. She has spent more than the past two decades organizing amongst the poor and dispossessed in the United States. She has led and won major economic and racial justice campaigns across the country, organized hundreds of trainings and bible studies with grassroots leaders, written in major national and international publications and recently published Always with Us? : What Jesus Really Said about the Poor and Revive Us Again: Vision and Action in Moral Organizing. In 2018, alongside the Reverend Dr. William J. Barber, Theoharis helped to launch the Poor People’s Campaign: A National Call for Moral Revival. Over the coming years, the campaign will organize poor people across race, religion, geography, political party and other so-called lines of division to fuel a moral revolution of values in the country.